Oum Chhay Street, Mondull II Village, Svay Dangkum Commune, Siem Reap, Kingdom of Cambodia. The property offers two room categories; One-Bedroom Suite and Two-Bedroom Suite. consists one king sized bed – 2m x 1.80m, and features a balcony with views of the city, air-conditioning, a separate sitting area with sofa, flat-screen TV with cable channels, free WIFI, dining table, washing machine and a fully equipped kitchen with fridge. Private bathrooms come with hairdryer and free toiletries. consists two separate bedrooms inside – each of the bedroom has one king sized bed – 2m x 1.80m, and features a balcony with views of the city, air-conditioning, a separate sitting area with sofa, flat-screen TV with cable channels, free WIFI, dining table, washing machine, and a fully equipped kitchen with fridge. Nestled in the heart of Siem Reap just behind the Royal Residence, Château d’Angkor La Résidence has been designed and decorated in a blend of Cambodian and French traditional style derived from the French colonial era. Our suites are perfectly designed for couples, groups of friends or family travelers seeking maximum privacy and comfort. With only 12 One-Bedroom Suites and 16 Two-Bedroom Suites, our focus is on providing a high standard of customer service to every guest. All suites are air-conditioned and come with private kitchen and dining facilities, spacious living area with flat-screen cable TV, balcony, fully-stocked mini bar, washing machine, ironing facilities, safety box and en-suite bathroom. Our property also features an outdoor salt-water swimming pool and an in-house restaurant. 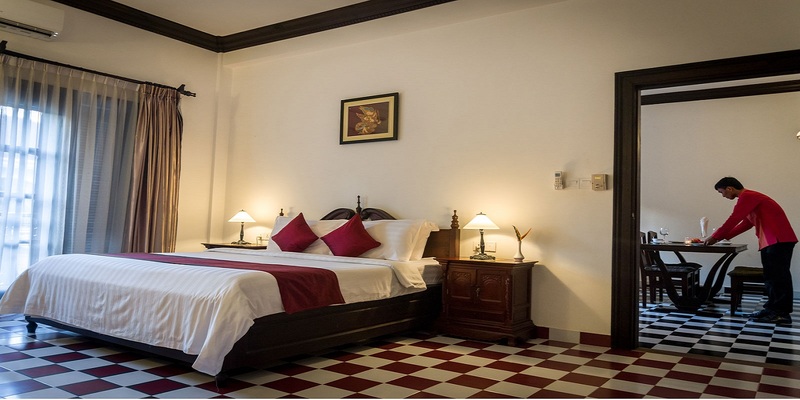 Located in the Old French Quarter of Siem Reap, Château d'Angkor La Résidence is just two minutes’ walk to shopping and visitor attractions such as the lively Pub Street or Old Market and it's only 15 minutes’ drive from the World Heritage Angkor Wat site and Siem Reap International Airport. The Kingdom of Cambodia is a place you should never forget. Stay at Château d'Angkor La Résidence for an experience that lasts a lifetime.